Search for Radioactive Ooze- x200. 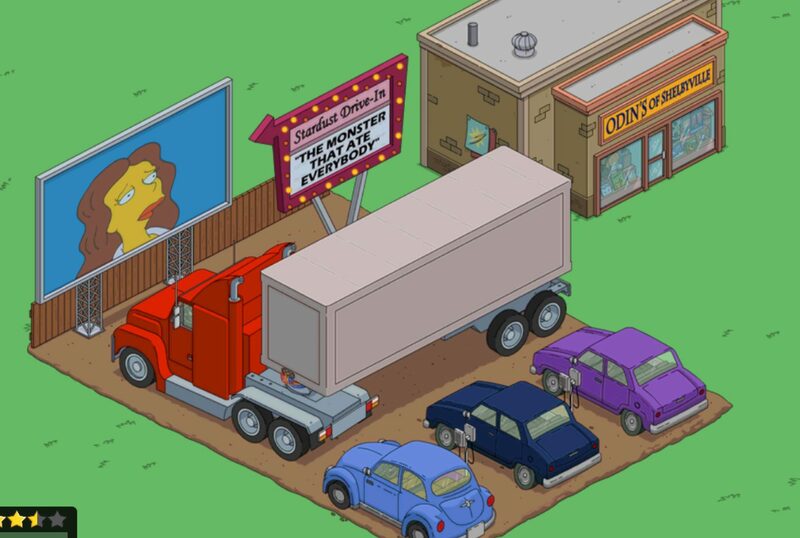 Once you’ve completed that task you’ll automatically be awarded the drive-in…. And you’ll have the option to store or place it in your Springfield. What are your thoughts on the Drive-In? Where have you placed it in your Springfield? Sound off in the comments below, you know we love hearing from you! 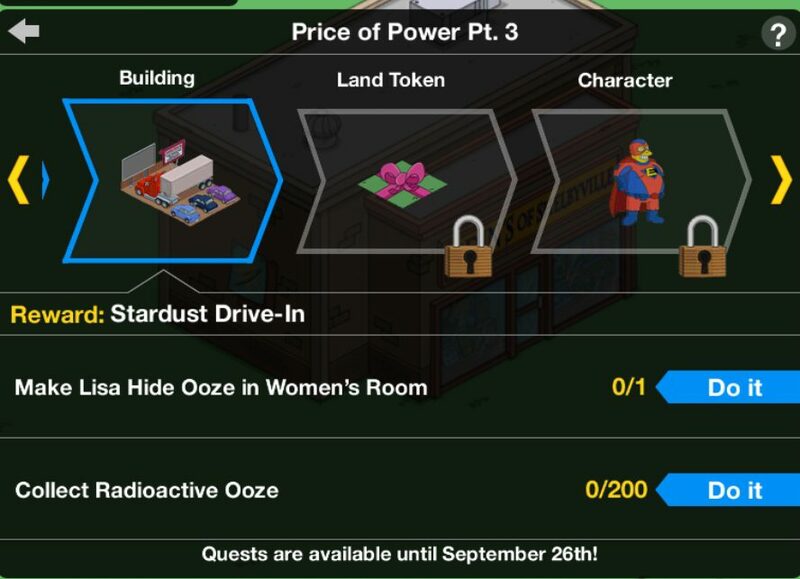 This entry was posted in Super Powers, Tips and Tricks, Updates and tagged Tapped Out Super Powers, Tapped Out Superheroes 4, Tapped Out Tips and Tricks, task at the stardust drive-in, The Simpsons Tapped Out, TSTO Addicts, TSTO Super Powers Mini Event, TSTO Tips and Tricks, what does the stardust drive-in do. Bookmark the permalink. E.A, make this thing play again. How hard can it be, come on, will ya? E.A, make this th8n come on, will ya? I thought I was just missing something……I didn’t even stop to think that EA would be that clueless to NOT offer any way to animate the movie again! Post ‘one and Done’ Task, I’ve put this in Storage ….. if you have enough space? 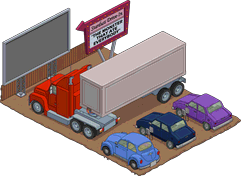 One could use all of those Vehicles earned as a Prize over the years to create a Drive-In Theatre Lot! I agree, EA blew it by not offering permanent Tasks here (for say Squeaky Voiced Teen, Cleetus, Grounds Keeper Willie, etc), but if EA does the right thing? I’ll quickly take it out of Storage. It’s sad this drive-in is closed, just like the real ones. You’d think… but they do already have an animated drive in. But lazy? Yes. Then why give us another that does nothing? This is so cool too. You can use Wise Guy Work a Clerk Shift or Weird Al Get Inspiration to animate it, of course you have to get them right beside it to do it. One of the worst designed items for a long while in my opinion… the articulated lorry makes it look totally stupid. Instant store for me. Actually, I think any rig we would call a “semi” counts, not just one that’s jackknifed. The “semi” is short for “semi-trailer”, since the trailer has no front axle. In the US, we also use the “semi” to refer to the combination of truck and trailer. I used to think “semi” was short for “semi-articulated”, but nope, just “semi-trailer”. Live and learn! It is a scene from the show. I wanted to store it and when I tried, I was not allowed to store it. I like my other drive in better than this one. It there anyway to store it? Perhaps after the mini-event is over. All the things that I can’t store, but don’t want in my town are shoved into the back right corner of my town…the SH buildings that generate products (that I don’t need any more since I hit a billion) and any event items that I don’t want, but can’t store until the event ends. Also, I shoved the building that comes with Janey there, since I love her jumping rope in my town, but hate the building attached to her. #1. What other drive in??? I want one that works! #2. I think the truck being in the front row is funny. If the movie was playing no one could see it but the trucker. #3. I know I can get weird Al but who is the wise guy and is he available and is anyone sure he would also make the movie play? Drive ins were such fun! I called him tony randall….. The laser tag building is the same…it has a fun animation, but no jobs there. Don’t get me started about the Sequel Stop. I’d also like it if another character could animate the Tap Ball stadium besides referee Homer who has a dz. skins and hundreds of tasks. Why is the truck blocking the view??! Today my Stardust Drive-in was randomly animated. I love scrolling through my town and large groups of buildings and decorations spontaneously activate. Lard Lad Donuts is just the right size for the projector house and concession stand. I think they are referring to when all of the buildings in a zone animate at the same time. I’ve yet to figure out the “why” or “how” part…but they do. I’ve never seen it… Thats pretty cool though!